The need is particularly noticeable in customer service. Organizations have done a lot to make their service more efficient. Two things they did not accomplish, though: making customers happier and lightening their employees’ workload. Companies pared down personnel; processes became more efficient... yet not simpler. Customers certainly noticed these changes — suddenly, it became difficult to track down a personal contact person, wait times increased, processes became less transparent. Just mention the subject of customer experience to consumers, and they’ll make a long face. Customer service agents aren’t exactly happy with their jobs either. Without intelligent technology, much of customer service staff’s work time is eaten up by routine tasks and searching for relevant data. However, to provide good customer service, employees should be able to focus on complex tasks. Their work would be more challenging and fulfilling, to boot. 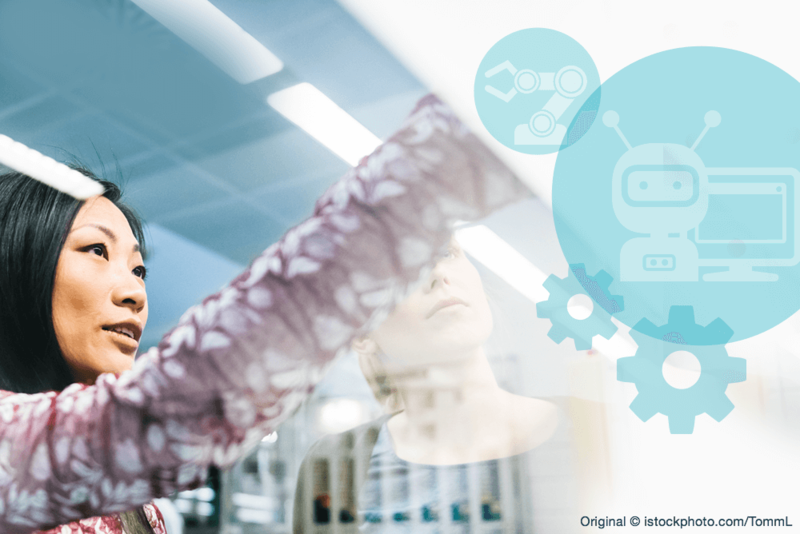 Digital networking, positive customer experiences and employee retention are just three of the critical reasons why intelligent automation in the workplace is becoming so important right now. One thing is for certain: If organizations want to master today’s challenges, they must undergo structural change and open up to the idea of using intelligent technologies. Manufacturing is showing us how automation works, and that it works. In manufacturing, tasks have successively been delegated to machines for decades. Automation began with the simplest manual activities. At some of today’s workplaces, humans intervene marginally. The idea of automating office processes isn’t exactly novel either. Or do you hesitate to use a calculator, nowadays? To use Excel programs? To turn on automatic spell check? We didn’t think so. Delegating cognitive capabilities to technology has become second nature, which proves: We’ve been considering how to delegate administrative tasks to machines for quite some time now — to increase efficiency and to avoid tedious jobs we’d otherwise have to do ourselves. Are we missing the boat on artificial intelligence? That said, leaders in politics as well as in business are signaling hesitation in their strategic orientation and even more so in the concrete implementation of digitalization measures. In Germany, for example, the digital transformation plays an insignificant part in the governance agreement between the ruling parties. New ideas? Innovative approaches? Intelligent solutions? You’ll search in vain. And, as this past February’s hacker attack on the German federal government has shown, the topic of “digitalization and security” is still a big question mark. How to better protect data? How to prevent misuse of intelligent technologies? These types of questions are becoming increasingly critical and should urgently be put on the government’s executive agenda. Like, now! We must keep on top of artificial intelligence, or artificial intelligence will rule us. Intelligent automation in the workplace is another step in that direction. Employing robotic process automation (RPA) technologies, we can use artificial intelligence (AI) to imitate how humans manage applications, processes and other human beings. Virtual robots equipped with RPA software can take over routine tasks from humans: The software analyses data and identifies relevant information. By integrating with other systems, it is able to feed relevant data into downstream processes. Higher efficiency: RPA and AI software work preciser and faster than humans ever could. The intelligent automation of business processes verifiably leads to an increase in efficiency of up to 90%. Simple technology: Robotic process automation especially is easy to implement. The technology can be programmed and implemented quickly, and maintained centrally. Little effort: Solutions based on RPA and AI can be built up gradually and integrate well with legacy systems. What’s more, intelligent automation doesn’t impact existing applications. Integrates well: RPA and AI software complement the work of human service agents seamlessly. Digitalization, information age, shortage of skilled labor: These are the three biggest challenges industrial countries are facing. On the one hand, organizations need to keep employees content, so they will stay. And on the other hand, they need qualified workers who can conduct personal, informed, proactive customer dialogs, so the customers will stay. The path to those goals is paved with digital networking and intelligent automation of business processes. Artificial intelligence in the workplace lightens the workload of staff and enriches their work life while it also improves the customer experience and demonstrably boosts efficiency in organizations.